State and county fairs are known for being a haven of unhealthy but tasty foods. I don’t know fo sure how the tradition got started, but local vendors were definitely quick to pick up on the fact that fair-goers were looking to indulge while they were out. Fair food moved from corndogs and funnel cake, to deep fried Twinkies and deep fried Snickers bars. And the trend presses on. Now fair vendors set out to outdo each other with the craziest deep fried foods you can imagine. 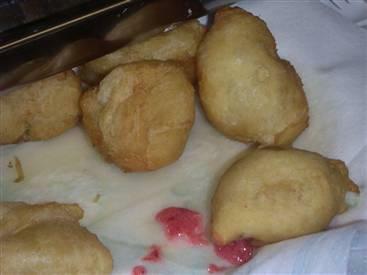 Deep fried cookie dough seemed “out there” when it hit the fair scene, this year Deep Fried Butter (above) debuting at the Texas State Fair, takes home the “most creative” title. The butter is flavored with things like garlic or strawberries, dipped in batter and fried. â€œItâ€™s like a mix between a biscuit or a croissant that is just stuffed to the gills with butter on the inside,â€ says the creator. The “best tasting” award at the Texas State Fair goes to Fried Peaches and Cream and other offerings include deep-fried pizza, deep fried chili and deep-fried grilled cheese sandwiches. Speaking of cheese, Deep Friend Macaroni and Cheese a big hit in Wisconsin. The fair version is very similar to that served in many upscale restaurants, except that it’s served on a stick to make eating easier. The Minnesota State Fair offers bacon on a stick (although I’m not entirely sure it’s deep fried, as opposed to fried in a skillet) and spaghetti and meatballs on a stick. The Canadian National Exhibition is also a haven for delicious, heart-stopping (literally, sometimes) foods. On the menu this year was chocolate covered bacon and a plethora of foods on a stick. I must say though, deep fried… butter? That’s pretty insane. I’ve heard of deep fried pizza and mars bars though. Not yet tried one, but a deep friend mars bars is definitely on the bucket list (perhaps the last thing on the bucket list. 😉 ). Btw, your blog was the first food blog that I started following and I must say, you’ve really inspired me. I would appreciate it if you took a look at my own blog, which I started this spring. Please take a look around and I’d welcome any comments and suggestions you might have. Also, if you like it, I would really appreciate it if you’d consider adding me to your blogroll (No pressure at all. ^.^). You’re already on mine and I hope at least a few people have managed to also discover your fantastic site! Chocolate-dipped bacon (on the requisite stick) also swept the Wisconsin State Fair by storm this summer! I was out of town for the fair, but everyone was talking about it. Holy deep fried butter. That is one thing I never would have thought of deep frying! Oh I love fair food! Another entrant in the ‘on-a-stick’ food craze at the Wisconsin State Fair came from the same chef who created the chocolate covered (frozen) bacon on-a-stick. He also served PB&J sandwiches, dipped in pancake batter and deep fried–of course, on-a-stick! I was not brave enough to try either the bacon of the PB&J, but folks who did said they were delicious. The problem with all of these foods is that people don’t know how to enjoy them in moderation. I’m down for a little fried food every now and then but it’s not a staple in my diet. 7544FI I want to say – thank you for this! It is really great article Baking Bites .